The Hiking Librarian: Extra, extra! Read all about it! Waiting for the sequel to a beloved book takes patience. Just as any good newshound, you find yourself doing the mental gymnastics of who, what, when, where, and why. Always hoping and expecting the author to hit one out of the park again. Well, for those of you who have been eagerly anticipating the sequel to Vince Vawter's 2014 Newbery Honor book, Paperboy, the wait is almost over. Without spoiling much, I can say it was definitely worth the wait. 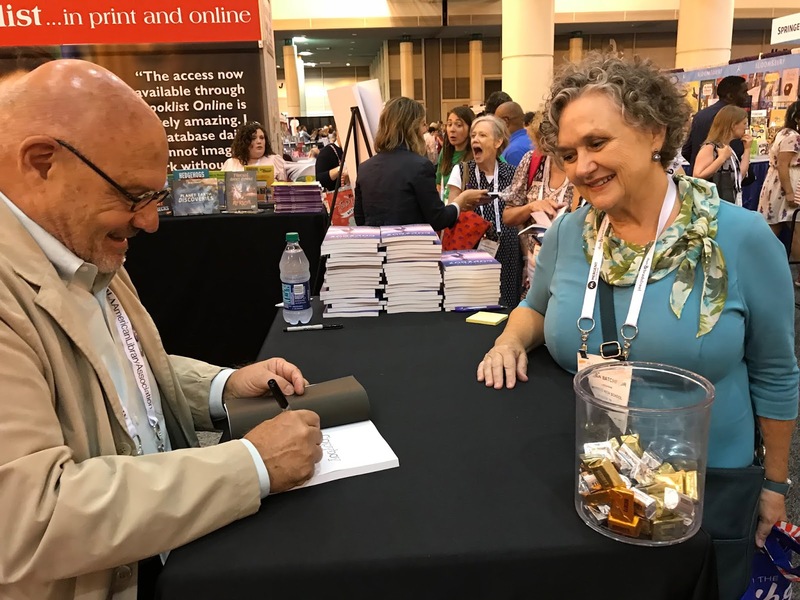 Recently, I attended the annual conference of the American Library Association held this year in New Orleans, Louisiana. 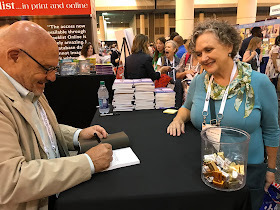 It was a pleasure to see Vince and his lovely, gracious wife, Betty, in the Capstone booth sharing advanced reading copies of the Paperboy sequel, Copyboy, with a few thousand of their librarian friends. 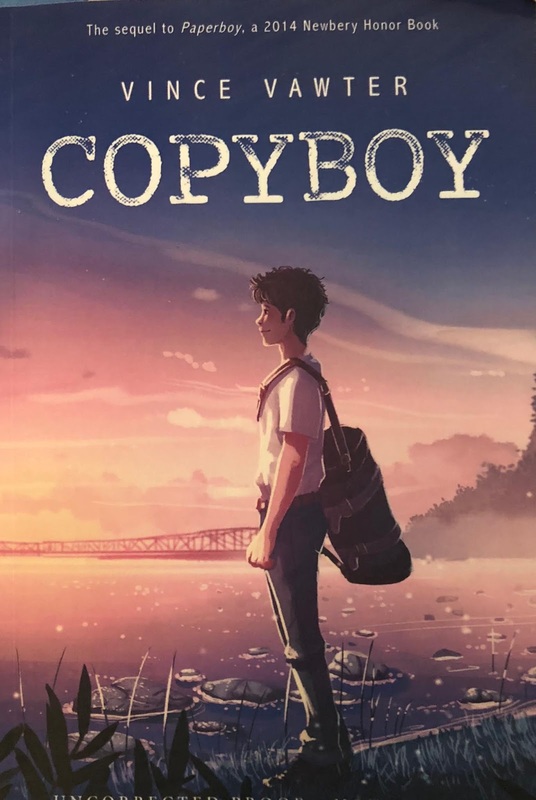 Copyboy is to be released officially on August 1. I'm just sorry you can't read it today. Vawter picks up six years after the original story. Victor is 17 and a high school graduate working the summer as a copyboy at the Memphis Press-Scimitar newspaper. The story begins as Victor is weeks away from leaving that job and heading to college to continue his studies and to play baseball. Copyboy is not so much about the boy we all cared for, but rather a coming of age story about the young man he has become––a young man struggling for his independence from an overbearing mother, a young man continuing to use creative tricks and techniques to disguise and navigate his stuttering, and a young man determined to keep a promise to a friend. Vawter takes us along as Vic goes on a search from Memphis down through the Delta to New Orleans and beyond. Is he searching for a spot on a map or is he searching for something deep inside himself? Along the way, Vic's original quest evolves, bifurcates, and morphs into the discovery of a whole new world of people, experiences, and courage. The writing is fresh, emotive, and exciting. I laughed and I cried, always a good sign. Many of the characters we already knew are represented here, and some are fleshed out to reflect the growth of the main character both emotionally and intellectually. New characters are well-crafted and interesting and the story is solid. I am already encouraging friends to pre-order Copyboy. I look forward to sharing it with my students when school is back in session. Wife, mother, and high school librarian––I live in rural Tennessee on the farm my family has been waking up to for 150 years. I love reading, photography, and hiking. On the weekends, my husband and I can be found hiking a trail in the state parks and national recreation areas of Tennessee and western Kentucky, but we love venturing to the Pacific Northwest, as well as to North Carolina to hike in the Blue Ridge Mountains.